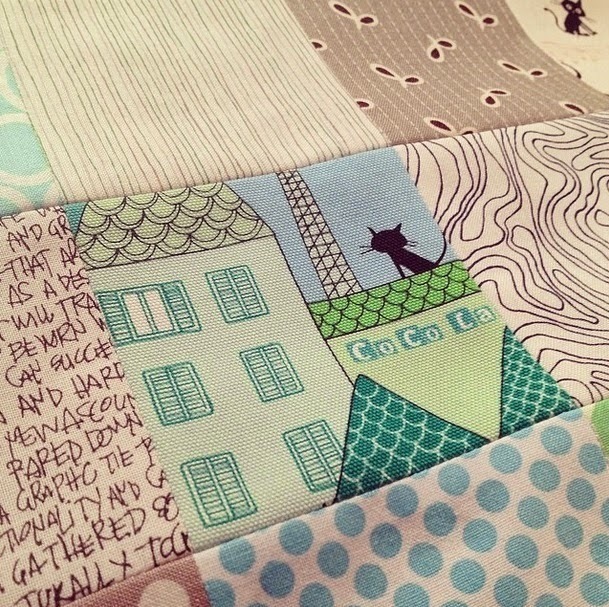 Skyberries Handmade: WIP Wednesday - A Quilt for Me! WIP Wednesday - A Quilt for Me! Of all the quilts I've made, the only ones that live at my house are the two cot sized quilts I made for my son before he was born. I love them both but a grown woman trying to snuggle up and keep warm under a baby sized quilt is not working! It's time to make a quilt for me! Here's my original fabric pull. The colour palette was inspired by a little zip pouch I made as a gift for a friend. Minty green is just about my favourite colour and paired with pale blues and a hint of grey it just sings! 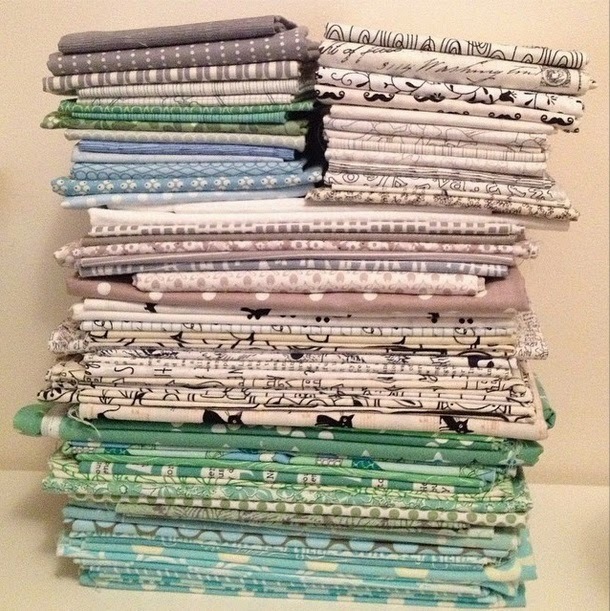 I also decided it was time to delve into my carefully horded stack of low volume black and white fabrics and I just love the resulting palette. 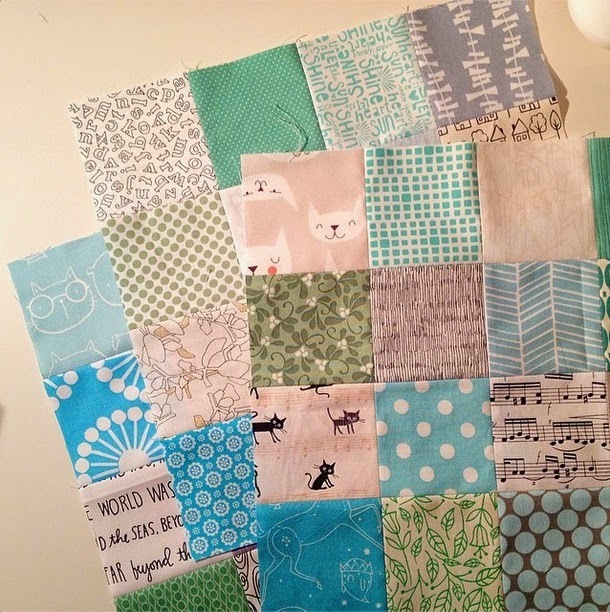 For the pattern I've chosen simple patchwork squares. I think the simplicity showcases the fabrics beautifully. In the end it took me two weeks to cut 543 3in squares from 105 different fabrics. 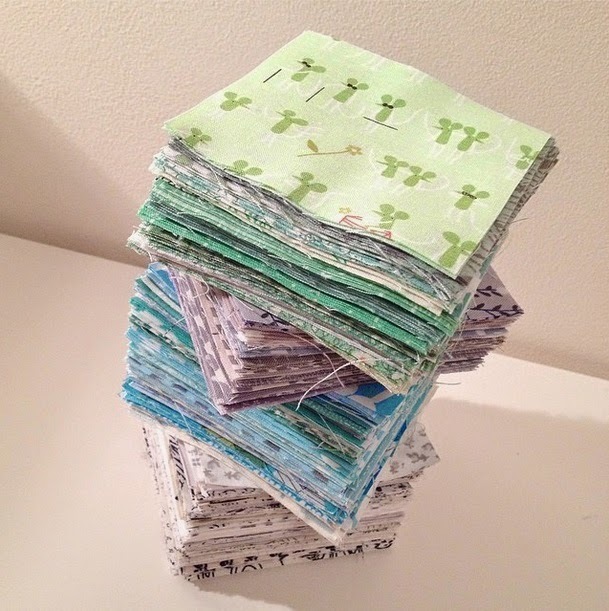 I love super scrappy quilts so lots of different prints was a must! I've decided to piece the squares into 16 patches before assembling these into the completed top. My fabric selection and placement for each block is largely random but I've chosen to alternate stronger prints with low volume prints to create a subtle checkerboard. So far I have pieced 10 of my blocks and I am enjoying this process much more than the cutting! It's quicker too! It's a joy to see so many of my favourite prints coming together. I just know I will thoroughly enjoy snuggling under this quilt when it's done! Happy to be linking up with WIP Wednesday at Freshly Pieced! So fun! I love all the cat prints. Obviously, I need to add some of these to my stash. It's a great palette of fabric colors and designs. I like the blocks so far, and that cute little cat square!